Library Newsette: IamInfoSMART Amazing Race is Back for Year 2! 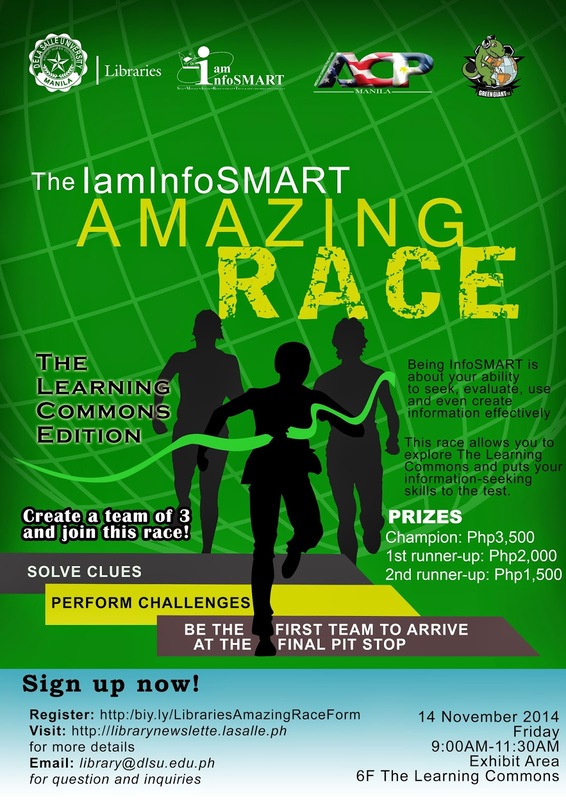 As part of the IamInfoSMART campaign, the Libraries will hold the IamInfoSMART Amazing Race 2 on 14 November 2014 (Friday), 9:00am with the start line at the Exhibit Area of The Learning Commons, 6F Henry Sy, Sr. Hall. The IamInfoSmart Amazing Race (based on the reality tv show The Amazing Race) is open to all bona-fide DLSU undergraduate students. - enlist at the Information Reference Desk at the 7th floor of the Learning Commons. The official list of teams will be announced via email and via the Libraries’ social media sites. Participants will also receive an email notification regarding the details of the event. During the race, there will be pit stop clues and challenges. Pit stops will include the different library areas such as the Cyber Space, Chill at the Fifth, American Corner, Discussion Rooms as well as the different sections. The first team to reach the final pit stop with complete stamps will be declared winner.